The March issue of Bike Buyers Guide is shops nationwide from today. As ever, it’s packed with bike news and reviews and of course the MAG Ireland column. This month Proinnsias Breathnach deconstructs a fairytale in search of a happy ending. Stop sniggering down the back! But can there ever be a fairytale ending where biking is wedded to the values we hold as a society or are we destined to forever be the ugly duckling of the transport world? Also in this issue, Roland Brown rides the latest offering from KTM plus there’s a look back at the classic racing season and a look forwards to the Moto GP 2016 calendar. 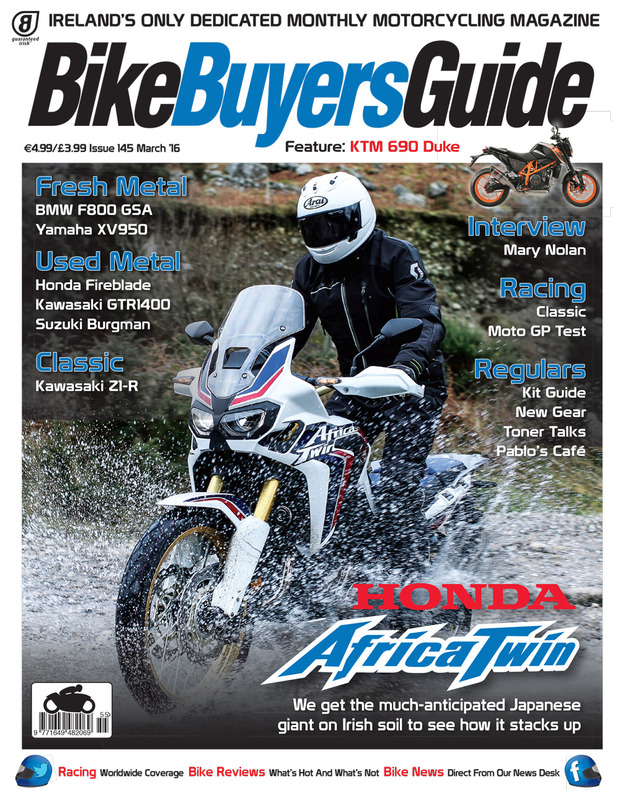 Elsewhere, you’ll find reviews of the BMW F800 GS, Yamahas XV 950 and the Kawasaki GTR1400 while a rather tidy Kawasaki ZR1000 from back in the day lines up with a Suzuki Burgman in the used metal section this month. You’ll also find all the usual regulars including the kit guide, Pablo’s Café and Toner Talks, plus of course the MAG Ireland page. Bike Buyers Guide, March 2016, In shops now.